I’m sitting here on this sunday, thinking of my previous week. It was an ending to remember, something that will definitely stick with me for the rest of my life. My senior class and I left Ohio to visit Tennessee for a week as our final “hurrah!” together. Leaving Ohio, it took about 8 hours for my senior class and I to arrive in Pigeon Forge, Tennessee. I’ll be honest — I don’t travel much, so this week long excursion was something I was definitely excited for. We stayed in a luxurious cabin that was three stories tall, had it’s own swimming pool, arcade, hot tubs, master bathrooms, and probably about four decks. All around there was the magnificent view of the smoky mountains uninterrupted. Panorama of the view off of the private deck in my room. I’ll admit that I was a bit lucky with the room I got to stay in. There were three luxurious king size beds, a private deck, and an amazing master bathroom equipped with a jacuzzi. Quick tip: don’t put bubble bath in a jacuzzi tub and turn the jets on (may cause a mass amount of suds and bubbles). I was, and still am, in love with my room there. It was more than a dream. Of course, we explored the local things that Tennessee had to offer. On one of our adventures we travelled through Gatlinburg, taking in all of the scenery. There were so many tourist attractions, something that I was definitely not accustomed to. Every other store had tshirts, henna and airbrush tattoos, and there were some cool shops in between. There was a sky tower and a lift that took you to view the top of the mountain. I probably should have taken some more pictures of everything, but I was seriously just so enjoying the moment! 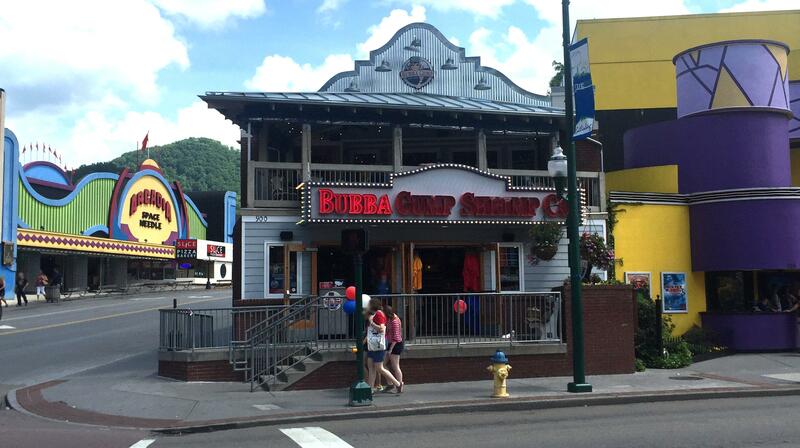 “Bubba Gump Shrimp” in Gatlinburg, Tennessee. Some of the other activites included ziplining at the Smoky Mountain Ziplines, going on an alpine coaster, and visiting the nascar gokart track! It was a lot of fun, and I would definitely recommend all of these attractions for anyone who visits Gatlinburg. Not only were they affordable, but they were tons of fun! Sadly, I didn’t get any pictures from any of these events — so you’ll have to check it out for yourself! Each attraction is suitable for all ages, too. This trip was honestly something that I will never forget for the rest of my life. From the bubble baths, to the pool, to the hottub, to the kareoke, to the arcade, and to midnight gossip sessions, visiting Tennessee with my senior class will always be an event I will hold close to my heart for the rest of my life. Get out, have fun, and live life — it passes by fast, and you will want memories that will last forever.